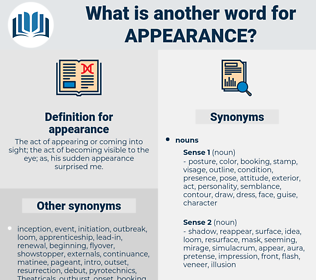 What is another word for appearance? semblance, apparition, reappearance, guise, shape, manifestation, pretence. considerations, remarks, nominations, Artifacts, VS, appear, appearing. perception, re-emergence, VS, surface, issuance, incidence, resurgence, publication, creation, intervention, facet, character, existence, landscape, printing, eruption, testimony, recurrence, feature, pattern, rise, outlook, committal, form, element. presence, arraignment, onset, impression, veneer, advent, hearing, emergence, aspect, image, performance, facade, aesthetic, cityscape, entrance. departure, leaving, reality, absence, conclusion, end, exit. retreat, parting, withdrawal, evacuation, fading, passing, farewell, retirement, going, vanishing, dissipation, dissolution, melting, exodus, emigration, egress, fadeaway, evaporation. Are you making an appearance in our house once more? I could notice scarcely a change in his appearance, walk, voice, and spirit. abramis, abhorrence, appearing, aberrancy, apparency, aepyornis, affranchise, abranchious, aberrance. emersion, return, apparition, reappearance, emergence. elaborateness, look, form, semblance, defect, beauty, colour, cast, deformity, sleekness, ornateness, decorativeness, persona, face, mar, blemish, disfigurement, superficies, disfiguration, homeliness, effect, plainness, phase, agerasia, impression, perspective, view, complexion, discoloration, gloss, ugliness, discolouration, Pilosity, hairlessness, countenance, hairiness, linear perspective, shape, format, image, stain, Etiolation, color, vanishing point, visage. semblance, 3D, illusion, front, three-d, 3-D.
materialisation, reappearance, apparition, materialization, manifestation. mental representation, internal representation, representation. natural event, Occurrent, happening, occurrence.